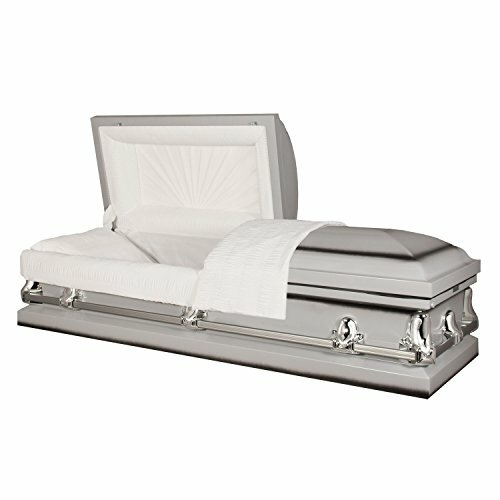 Titan's Orion silver casket is a magnificent casket to honor man or woman. Meticulously prepared in a high-gloss silver finish, our Orion silver casket impresses with sculpted, detailed hardware, reinforced stationary handles and white crepe interior. Made of 20 gauge steel, it features our 'soft to the touch' interior bedding in a white crepe interior. No expense is spared in creating this beautiful tribute: the casket is completed with an adjustable bed, and rubber gasket. Our Orion silver casket incorporates squared-corner design. If you have any questions about this product by Titan Casket, contact us by completing and submitting the form below. If you are looking for a specif part number, please include it with your message.